I often get asked, "What do you with all of your quilts?" Admittedly, having 34+ quilts to show at last night's guild meeting did make me feel a bit ridiculous. And in my defense, I have postponed sending some as gifts to specific people because I wanted to use them for that meeting. Sometimes when people ask me why I make so many quilts (and what do I do with them?) - I feel a little defensive. I think they might wondering, "How does she have the space/time/energy?" and I feel that there is an implied judgment, "She has nothing better to do." "She must be neglecting other things." (Well yes, the housework often gets pushed to the side, I must admit). Of course - 99% of people don't have unkind motives when they ask that question - most of them are probably just curious. I must say that we do use my quilts a lot. I like rotating them and having something different to sleep under frequently. Having more than one quilt for each child comes in handy too. So my usual reply to the title question is, "We use them." This is the AWESOME haul I came home with at the little guild sale from last night. Fat quarters were .50 cents and yardage was $2 a yard. I came home with 5 yards of black Kona, lots of little solids bundles, some AH pumpkin fabric my kids already love, and lots of great black and whites- I have my sights on making something like this soon. I have never been to a "yard sale" type setting that sold fabric I actually really liked - so this was a total score. I also came home with loads of free cross-stitch fabric I plan to mostly pass on to my sister who has become addicted to the hobby. Tonight I gave a presentation on modern quilting as well as "my quilting journey" to the Chelmsford Quilt Guild. My mom kindly babysat the kids and my husband came with me to help transport the 34 (!) quilts and show them during my talk. I was a little nervous initially but it was fun and I soon became more comfortable. People were very kind afterwards and gave me words of encouragement. One lady said my talk was, "very interesting," in a tone of voice that made me wonder if it was actually a compliment :) But it was good and fun and really not hard to talk about what I love and am passionate about. In preparing for this, I looked at several books and websites to find the hallmarks or traits of modern quilts. I thought you all might be interested in reading the list I put together. 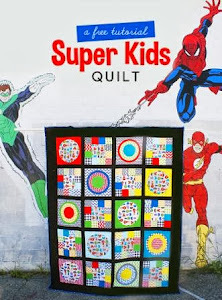 The sources I used include the MQG website, Sunday Morning Quilts, an article on the Modern Quilt Guild in the 1st issue of Quilty, Modern Designs for Classic Quilts, and Liberated Quiltmaking II. I felt like I was writing a term paper! Large scale- quilt is one large block of made from a handful of large blocks. Use of different kinds of fabrics – quilting cottons, velveteen, linen, muslin, etc. P.S. Hello to any CQG members visiting my blog. If you are also interested in the BMQG - you can find more information here. We'd love to have you join at us at any of our meetings. The blue floral is a Nani Iro splurge I bought during my trip to Denver last fall. The rest are stash fabrics - including a nice yard sale find (the darkest green). I almost made the quilt dominantly pink but I started with the green because if Charlotte ends up keeping this one - I want her to have something that is something besides pink. Nick helped me decide that green was the way to go - he was home all day yesterday because of another snow day. Here's the completed quilt top- there wasn't a lot of planning involved and I am pretty happy with the results. I think this kind of "pattern" would be nice done up as a larger quilt (shocking coming from me, I know). But if you had a large scale print that you just loved - it would be a nice way to showcase it with a bunch of solids and a few low-impact prints. I went to the retreat exhausted (thanks to my kids, for giving us less than 4 hours of sleep before I left!) and came back exhausted - but it was a "good" exhausted because I had a great time. Unfortunately, I forgot my camera, so this post has shots I took when I came home. I spent most of my time working on what what was soon dubbed, "the clamshell monstrosity." It is probably the least enjoyable project I have ever worked on but the frustration was softened by being surrounded and cheered on by friends. This project is an adaptation from a clamshell pattern found in Sandi Henderson's book, Sewing Bits and Pieces. I started this project in July 2011 and it was abandoned till last week. I came to the retreat with the partially begun quilt top completely taken apart, 105+ clamshells precut, a large piece of prewashed muslin, and lots of tinfoil and spray starch. I am SO happy I got it all done - if it hadn't been for the "special-ness" of the Mendocino fabric (you can't find a fat quarter on ebay or etsy for less than $10!) and the retreat - I would probably have had to relegate all those lovely clamshells to the scrap basket! Now I need to add borders and get quilting. Surprisingly, I still had a bit of time to return to this project with the string blocks and hexagons. Jen helped me with my "lining up" issue and by the second attempt - I had a near perfect block. I don't have the time or patience to redo the less perfect ones but I am sure the last twelve will be great. Retreat was just awesome! I love hanging out with my guild peeps and seeing what they are working on. Even though we all come from such diverse backgrounds and have different tastes, we really do "speak the same language." I really wish I could've come the extra day (Thursday instead of Friday) so that I could've relaxed a little more and socialized even more - but overall, it was a great experience. We even shared the gym with my traditional guild that I have been a part of - a group from Chelmsford- and they were a lot of fun too. I hope to tackle some of my WIPs and UFOs this weekend at the annual BMQG retreat. I feel like a kid waiting for Christmas to come - I am so excited to get away for a bit and have unlimited sewing time. I have also had this quilt sitting on the brain for a while - combining Greenfield Hill fabrics with the Ghastlies collections is pure genious! I asked Jamie if she minded if I copied her and she said she was fine with it. So much fabric so little time! 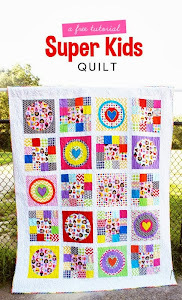 On age 83, my Princess improv quilt is featured! I love what they did with it and feel so honored to be part of the publication. (I forgot to mention this earlier - but I was also interviewed for an article for last month's issue about participating in modern guilds. I was quoted (gushing?) in reference to my positive experience in making friendships within the BMQG). Quilty is the first quilting magazine that I feel is actually accessible for me: it covers quilting topics that are relevant to me and I really like the patterns they publish. I also love that they frequently feature quilts made out of "stash" rather than constantly promoting specific fabric companies by only featuring quilts made out of one fabric collection or another. The opportunity to have our quils featured in Quilty was thanks to Mary and Marianne Fons visit to the Lowell Quilt Festival last summer. They toured our BMQG show and visited with the small group that had been manning the exhibit. It was so much fun to meet them and you couldn't help but feel excited to get back to your machine after chatting with them. We are at a critical juncture within the quilting industry when the average age of the quilter is static (age 70) and home economics (where so many are introduced to sewing) is not being taught in the schools. Careful attention and senstivity towards the beginning quilter is crucial. We must be welcoming and encouraging and start with the basics when it comes to educating the newbies. Be accepting of other's tastes and styles - in the blogosphere - the phrase is, "It's okay to not like things, but don't be a jerk about it." There will always be different trends in quilting but the bottomline is (quoting Marianne), "When anyone makes a quilt, it's a good thing." I felt renewed after listening to Mary's presentation. Recently I have done some reevaluating of my quilting style and preferences as well as the way that I want to approach blogging. For me, it comes down to this quote that I recently came across, "I just want to make beautiful things even if nobody cares." That doesn't mean that I am not psyched to be featured in Quilty and winning the Andover contest wasn't awesome- but at the end of the day, I want to quilt and sew simply because I love it. I decided to share my most favorite finish first, the DS 36-Patch. It measures about 90 x 108. I did a double loop squiggle (technical term) at the longarm quilter's studio to finish it up. It is backed and bound in two Hope Valley prints that I got on a super sale over the winter. The funniest thing about this quilt is that I didn't really like it until I put it on my bed. I just think it looks great when it's in use - I had my doubts all along as I was piecing and quilting it. It's so traditional and this has made me realize how much strength there is in simple, classic patterns. I also love, love, love Denyse Schmidt fabrics - some of them seem kind of ugly but then you use them and it's like, "wow - that's a genious print." This quilt was Charlotte's main present as well as a doll and a stuffed lamb. She now has about five quilts- it's just too fun to sew for a girl! The administrator of the Pantone Emerald Quilt Challenge suggested I enter this into the contest, so I am linking this post up with her challenge here. It measures 47 x55 and the pattern is Cub Crawl by John Adams from the Fat Quarterly book. If you have made a quilt recently with green in it (and it's okay to have another color too) - consider entering - it's easy!